Well, it is raining and quite gloomy here in Maryland this afternoon and so not the best day for working on my pictures for the upcoming eArticle. So I’m taking a break from that to play around with watercolor pencils, watercolor crayons and Gel-Sticks again. In my post yesterday, I compared coloring these three mediums directly on watercolor paper and gesso prepped paper as well as dry blending and water blending them on the same surfaces. Today I compared them using a different application technique: touching a waterbrush to the tip of each medium and then painting the color onto watercolor paper and two types of white cardstock. 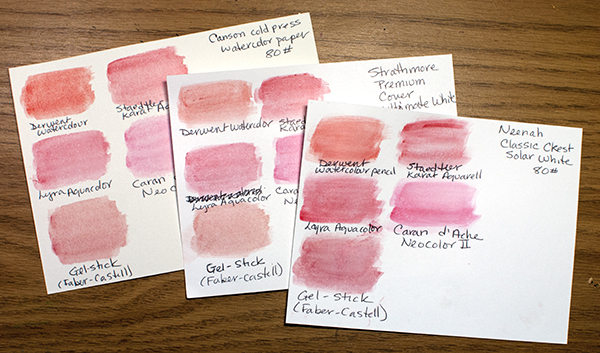 This time, I tried each of the five art mediums on three types of paper. The first was Canson cold press watercolor paper (80#.) I touched a waterbrush to the tip of each art medium and brushed it several times across the paper to create a swatch, cleaning the brush by running it across scrap paper between each art medium. The five mediums all did fine to my eye, although I thought that the Gel-Stick painted swatch was a bit dull and grainy. The color doesn’t seem as pigmented as some of the other swatches, which is interesting because when colored directly on paper, it has a lot of bold color. It probably has to do with the ability of the waterbrush to lift color from the Gel-Stick. I thought that the two watercolor crayons had the smoothest color. I liked the Neocolor II the best, but I think part of that is that I like the shade itself, so there may be some bias there. The second test was the same five art mediums on Strathmore Premium Cover Ultimate White (80#). This whiter paper makes the color pop a bit more, but I think the color was more even on the watercolor paper. I still liked the two watercolor crayons best here. The final test piece was the same five art mediums on Neenah Classic Crest Solar White (80#). While my brush strokes seemed to show up more on this surface, the color pops really nicely. I think the color itself is prettiest on this surface. The Derwent Watercolour pencil in particular looked nicer on this paper than it did on the other two papers. I still have to say that I’m personally favoring the watercolor crayons for this technique. One thing to consider here is that Gel-Stick becomes permanent once dry, so for some projects, that would be an advantage. You could also let the first layer dry and then do additional layers of color to build up color if needed. Another way to use these mediums as paint is to scribble them on a palette and then pick up the color using a waterbrush (or a water-based blender pen.) 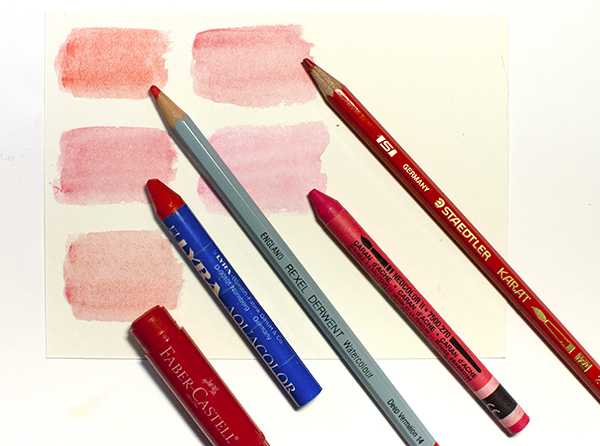 A slick palette will work for the watercolor crayons or the Gel-Stick/Gelatos but you’d need to use scrap paper as a palette for the watercolor pencil as it will not leave much of a mark on a slick palette or even a textured craft sheet. So to keep things more even, I used the touch-with-a-waterbrush technique. Keep in mind that with any of these, you could use either of these painting techniques to create a wash of color in an area and then you could go back in and layer more color on top in some areas using the art medium directly (either wet or dry.) You would have the most control doing this with colored pencils. 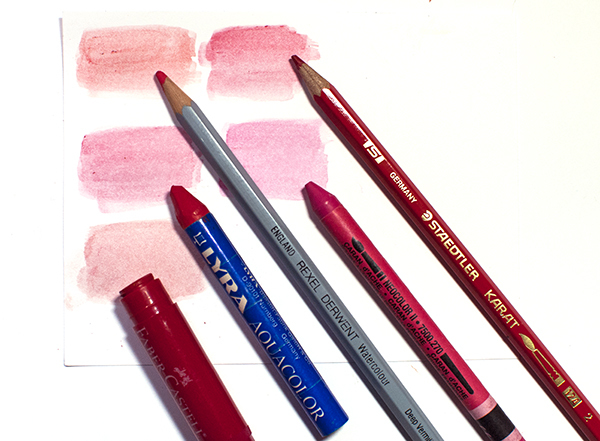 (For example, use a waterbrush to lay down a wash of red colored pencil on an apple outline stamped in permanent ink and then use the colored pencil itself to directly add shading on top of this base layer of color.) You could do this with watercolor crayons as well, although the Lyra Aquarell have fairly chunky tips so you couldn’t get too finely detailed. The Neocolor II have a smaller tip and so would be easier to use this way. The Gel-Stick or Gelatos have a broad flat tip that doesn’t really lend itself to this use. All of these mediums are perfectly usable in a stamped piece. Sometimes you just need to pick the color you like best. Other times you need to decide exactly how you want to lay down the color and how you might want to do layering. As with yesterday’s play, time spent experimenting with art mediums and comparing them head-to-head can be helpful in making choices for future projects. I hope you will try this with the art mediums and brands that you have! For these experiments, I only compared watercolor pencils, watercolor crayons and Gel-Sticks/Gelatos. I did this because they have similarities that allow them to be used in some of the same techniques. There are of course other art mediums for adding color to our stamp art, including watercolor markers, alcohol ink markers, chalks and pastels. These three are just the ones I’m currently playing with. What are you playing with? 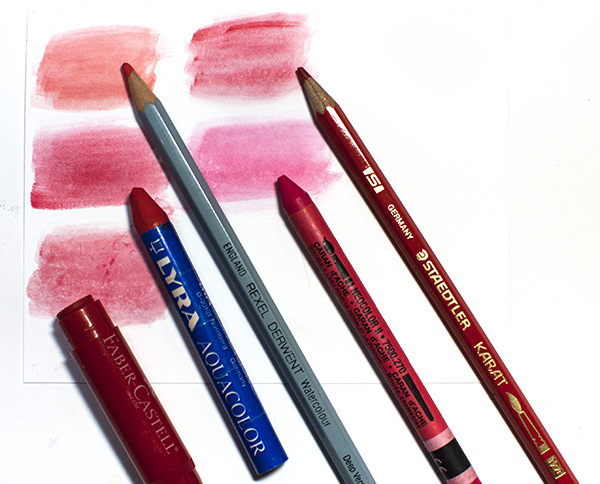 I love the Faber Castell aquarelles….much better than the Lyras. They are my fav! Thank you for the examples . You help me realize how many products I have that do the same thing . Even though I have like tools stored together I fail to take time to compare them. Nancie, Love this article, but then, all of you articles have been great. Thank you! Now I need to go play!